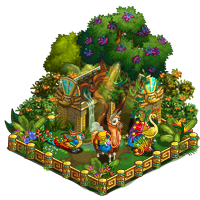 FarmVille Jungle Hideaway of the new farm Fields of El Dorado will one of the crafting building where players will craft materials and ingredients to fulfill orders in order to unlock new animals. This will be similar with the Elite Horse. There will be 15 exotic animals to unlock. Players are reporting that the bushels can now be exchange from the bushel swap. Try collecting the bushels that will be need to craft parts for the Terrace upgrade so that you can hold more goods. The Terrace and Den will hold the materials for Jungle Hideaway. It is advised to upgrade them whenever possible so that it can hold more materials.